Conveyor belts have been in use since the 19th century and were used primarily in ore mining. The conveyor belts at that time were used to load rail cars more efficiently. The ore was transported out of the mine on ore carts and then loaded on to the conveyor belts for loading rail cars. Around the turn of the century, new technology was introduced that allowed miners to load conveyor belts inside the mines. Currently the longest conveyor belt in the world is approximately 100 kilometers or 62 miles long and is being used in a phosphate mine, in Western Sahara. Conveyor belts today are in use, in many industries other than mining. Airports use a conveyor system to load and unload baggage, and to make the baggage available to their passengers. Conveyor belts can be straight, curved or even circular. Conveyor belts were revolutionary in mass production. Employees could stand in one place, and the product would come to them for packaging or inspection. Along the conveyor system, each worker would perform a task and the product would move to the next station. Chain type conveyor systems are widely used in the automotive industry because of their carrying ability. The chain conveyors are ideal for transporting bulky car parts. Chain conveyors are useful in manufacturing because they can carry items stacked on pallets. Chain conveyors have reduced the need for forklifts in many warehouses and manufacturing plants. The conveyor system itself is relatively straightforward. The term belt is used to describe the surface on which the product is transported installed on conveyor rollers. Belts can be made of rubber, nylon, steel or a combination of materials. The belt can be solid surface to prevent items from falling through or a screen type to vibrate and sort different sized ore or gravel. Conveyor belts can also weigh product as it is transported. This is useful in particular when loading trucks or rail cars that can only carry a specific weight. Conveyor belts can be portioned off to help contain loose material when the belt must be inclined to load or unload trucks. The belt can incline as needed and the loose material will not slide or fall back on the conveyor belt. Individuals looking at this type of system may be reminded of a water wheel that scoops the water. The compartmented system is called an elevator belt because of its incline capabilities. The elevator belts can be used for any loose material such as gravel or mineral ores and even coal. 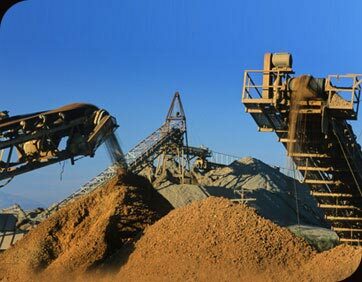 Because, of the incline capabilities sand, and gravel can be mounded higher to save space. The conveyor can incline to dump product at the top much higher than the standard bucket loader. Conveyor belt system can be used in farming for transporting product from the fields. There is a loading point where the produce is loaded on the conveyor and transported to the sorting and processing sheds. Conveyor systems can be portable and easily moved from job to job. Conveyor belts are used in grocery stores, so the clerk can check customers out more efficiently. Walk machines in many cases use a conveyor belt system, as do escalators. Conveyor belts have done more than just transport products they have transported industry forward.